Somehow my wish list always seems to include a number of beauty products... K-beauty continues to be my jam and green beauty is also up there.. How cool is it that Nordstrom now has a dedicated natural beauty shop? 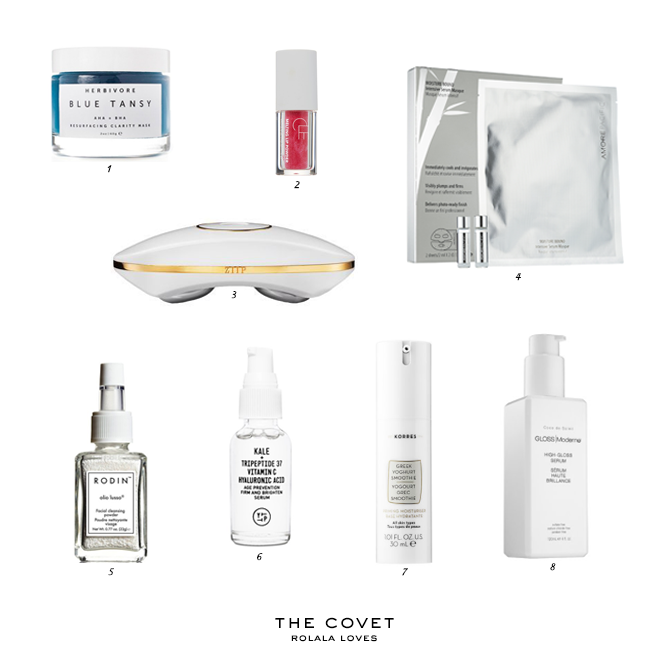 What are you coveting lately? I'm currently in love with the Herbivore Botanicals Brighten Pineapple Enzyme + Gemstone Instant Glow Mask (check out my mini review!) so this mask which is supposed to be like a facial in a jar is next up. K-beauty never fails to blow me away with their innovations. This product transforms from a powder to a long-wearing lip tint when you put it on! Now that's pretty flipping cool. I became interested in beauty devices when I started using a long forgotten home microdermabrasion device regularly with positive results at the end of last year. The ZIIP Beauty Nano Current Device uses gentle electrical wavelengths to firm, brighten and banish fine lines, dark spots and acne. Some lofty claims and I'm definitely intrigued. My husband actually offered to buy this for me for my birthday but I can't justify the cost right now. This unique two step ampoule mask works to instantly boost hydration, firmness, and radiance while an exclusive blend of 5 Asian botanicals work to restore and improve skin's ability to retain moisture. It sounds like a perfect solution for keeping dry winter skin at bay. This cleansing powder that combines granular rice bran with moisturizing jojoba, sea algae along with olio lusso's signature Jasmine and Neroli scent allows you to customize your cleansing routine based on your skin's needs and your personal preference. Cleansing powders are such a lovely way to gently cleanse and clarify in the mornings. My husband and I currently share a bottle of Farmacy New Day Gentle Exfoliating Grains (review) which works equally well on our very different skin types and I think this would too. A high performance, firming and brightening serum loaded with kale and spinach for a healthy looking complexion. There's something really appealing about skincare which combines superfoods and science. I mean if it's good enough to eat, it's certainly good enough to put on your face. This double duty moisturizer and primer is packed with with 26 percent Greek yogurt proteins to deeply nourish and smooth skin, while prepping it for flawless makeup application and all-day wear. I'm already a big fan of their Suncare Yoghurt Nourishing Fluid Veil so I'm thinking I might like this as well. This unisex, luxury serum offers up brilliant shine, heat protection and control in a formula that is clean and cruelty-free. I'm partial to multifunction hair care products and this sounds like one that my husband and I could share. Great wish list, you sparked my interest in these products. This clarity mask sounds lovely! Melting lip powder sounds very innovative, I never tried it....so wonderful that it becomes lip tin when you put it on your lips. That Nano Device sounds so cool! Why not accept it as a bday present from hubby? Give it some thought and if it is something you really want, why not treat yourself? It is ok to have a treat for one's birthday:). Intensive Serum Masque sounds fabulous too. Great picks dear! I try not to do any Currently Coveting posts and to focus on my stash. If I were to list all the things I want to buy, I would probably go buy them and end up broke and with even more stuff to finish. Oooooh, intrigued by the ZIIP device for sure. I will like to try the lip product sounds amazing. I'm finally quite happy with my beauty routine right now, but I'm coveting a lot of books! Eeeeeek! All of these! ALL! I want them all. Such a great wish list, I would like to try them all! sound like wonderfully luxurious products. I love a great masque or facial in a box. What an amazing wish list, Rowena. I've seen the brand Youth To The People on Sephora but frank hasn't read many reviews on them. Definitely look forward to your review if you get it. I think you should definitely get the ZIIP Beauty device. As soon as I saw it, I was like, what is that? I need to know if it works like it says it does. It would be a great bday gift for you and a good investment in your skin and your blog (because I would love to read your review on it, lol). I would say that the ZIIP device is the most eye-catching of all! The design is so futuristic! Hey thanks for the heads up on Nordstrom's Natural Beauty section VERY cool. I had no idea. And I would gladly take one of each of these. What luxurious sounding skin products! I'm getting my husband to try the Tatcha rice enzyme powder so i hope he enjoys it. The Korres yogurt moisturizer also sounds really cool! Number 3 looks metal. Buy it and do a proper review of it please, haha! I'm so intrigued by #2 and #3! All these products have an excellent presentation, which makes me feel confident that they should give good results to those who use it! This post is very informative for me because all the products are new for me. Thanks for share with us! All these items sound really awesome! I would like to try that beauty device! I love my Clarisonic, but this device sounds like it would work well for my skin too!